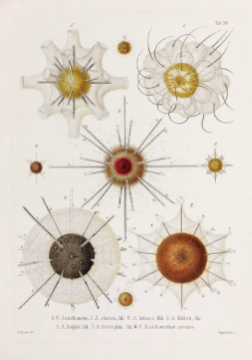 19th Century Drawings of Microbes #ArtTuesday « Adafruit Industries – Makers, hackers, artists, designers and engineers! These detailed drawings of microorganisms from the late 19th century highlight the intersection of art and science. The collection could be called Fantastic Beasts and Where to Find Them! Not all contributions to science come in the form of numbers. For instance, the German biologist Ernst Haeckel’s incredibly detailed drawings, made during the late 19th and early 20th centuries, shed light on the microscopic organisms that populate our world. In 1899, Haeckel published a book entitled Art Forms in Nature, hammering home his point about the connection between art and science. 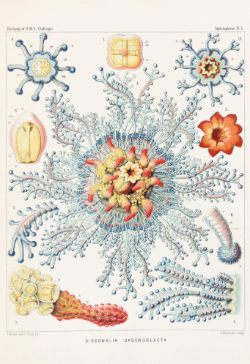 As Rainer Willmann, a professor of zoology at Gottingen University and the director of its Zoological Museum, writes in The Art and Science of Ernst Haeckel: “With such a title he sought to secure the attention of those with an interest in the beauties of nature, and to emphasize, through this rare instance of the interplay of science and aesthetics, the proximity of these two realms.” He hoped that both artists and scientists would find inspiration in his pages. 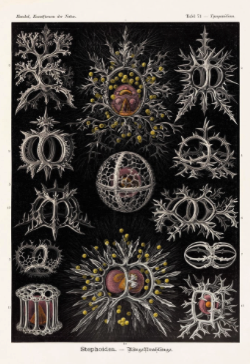 Haeckel’s drawings are a reminder of the intricacies of the world around us, and how nature is the ultimate designer.